There are plenty of amazing ocean animals out there, but one of the more overlooked ones is definitely the mantis shrimp. These stomatopods are an ancient creature that are just as brilliantly colored as they are talented hunters. But they're definitely more than just a pretty face. Along with having a legendary mantis shrimp punch, there are many amazing facts about these sea creatures that definitely put them a cut above the rest. Some are brightly colored, while others are far more muted. Some are massive - the size of a small lobster - while others are barely the size of your finger. What's more is that we're still discovering more about this animal, because it is intensely secretive. What we do know about these critters is still enough to turn a few heads. By the end of this, you'll probably agree that they're super amazing, but probably will never want one as a pet, for very good reasons. Despite their name and appearance, mantis shrimp are not truly shrimp at all. Instead, they are a crustacean more closely related to lobsters and crabs. Their name mostly refers to their close resemblance to praying mantises, an insect you might be able to find in your garden. However, unlike the mandibles that mantises have, this creature has something a little different. On the ends of its front legs, mantis shrimp have a a raptorial second thoracic appendage, that makes them unique from both mantises and shrimp, as well as crabs or lobsters. Most animals have a language that confuses or completely eludes us, but mantis shrimp take their language one step further. Rather than just making noises, mantis shrimp have found a way to communicate with each other in a super secret code. 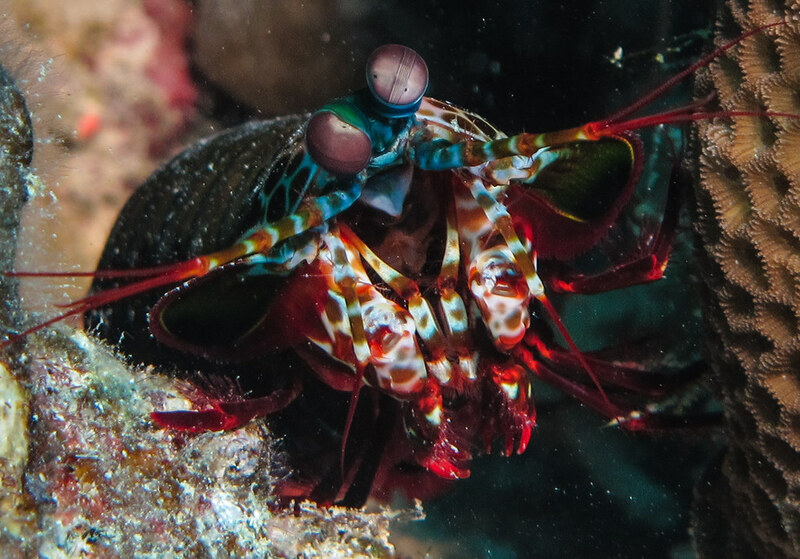 Researchers discovered that, in order to communicate via secret code, mantis shrimp will bounce polarized light off their bodies in different patterns to get their point across. Their bodies have areas called maxillipeds, and there are spots of color on these appendages. The mantis shrimp has the ability to bounce and manipulate the light to scatter across the spot's surface, and then other mantis shrimp interpret those signals. Other animals can't understand or see this. As far as ocean life goes, it's pretty apparent the mantis shrimp is one of the most brilliantly colored animals there is. What's more, they come in a vast variety of different colors. To date, there are over 350 species of mantis shrimp on record, and most have slightly different color patterns. Some are simple and light in color, while others are iridescent and neon, like the animal pictured here. 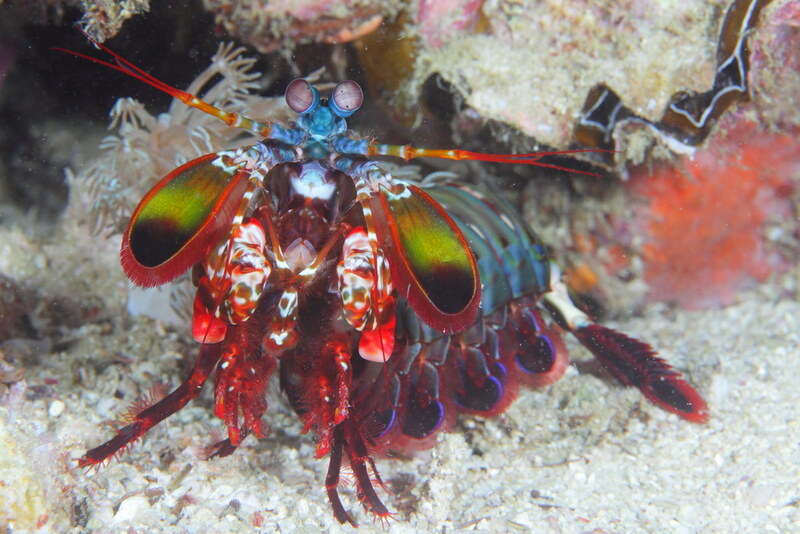 One of the most colorful is the rather large peacock mantis shrimp, so called because of the way its body resembles the feathers of a peacock. The peacock mantis shrimp is sought after for its color. There are few animals out there who can pack more of a punch than this creature. Many mantis shrimp species tend to eat clams and other hard-shelled mollusks. They can afford to do this because they can attack with their super-hard claws with all the speed of a .22 caliber bullet. Those little claws move so fast the human eye cannot detect them, and impact a surface with more than 160 pounds of force. The attack doesn't even have to be perfectly on target, because the shockwave they create as they move can be deadly all on its own. 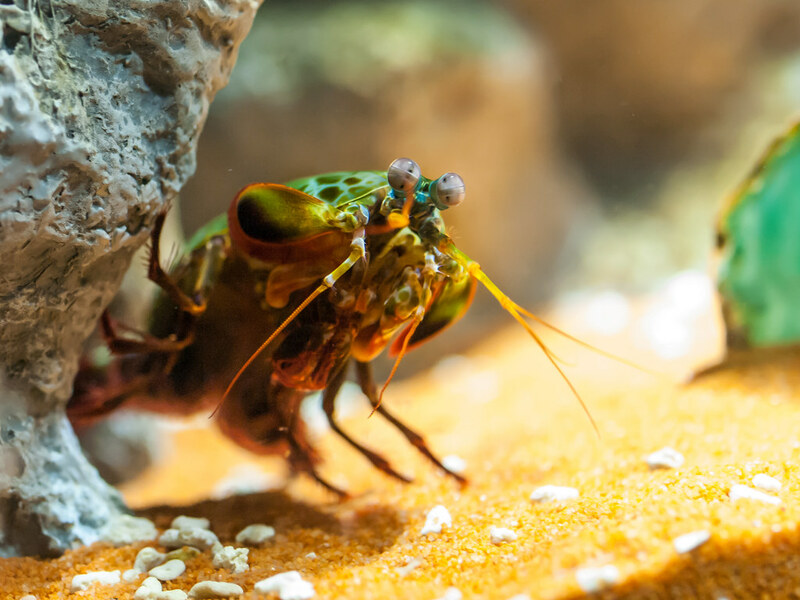 They also tend to be predatory in nature, so whether it's a fish, mussel, or potential enemy, the mantis shrimp is going to take them down. In some cultures, the mantis shrimp is known as the "thumb splitter," and given this information, it's easy to see why.